Married at 14 and widowed at 16, life for Jharna Karjee (31), has been a roller coaster. After the death of her husband and with an infant to look after, she felt her world crashing with nowhere to go and nobody to depend upon. She had to return to her parents and started being involved in agriculture with them. She also leased some additional land for additional economic opportunities. Encouraged by her parents and determined to challenge the misfortune she was faced with, Jharna started spreading her wings and exploring further opportunities not only for herself but also for the fellow-sisters from the village. To strengthen a sustainable economic life she opened a petty grocery shop in her home and got involved in the self-help group activities. Both pursuits exposed her to evolving opportunities and she soon became part of the local farmers club and the Krishi Vigyan Kendra (Centre for agriculture science) under the Uttar Banga Krishi Vishwa Vidyalaya (UBKV) Cooch Behar. She was mobilizing local women for their participation in different programs for the community. Jharna’s commitment, hard work and a will to do something different could not go unnoticed and when DSI4MTF was launched, Jharna was identified as a community leader to mobilize farmers into different collectives and organize and participate in the project activities related to water management, technology development and agriculture intensification. Jharna showed her grit and commitment and was appropriately captured by the local media. Jharna moved consistently and explored innovations in agriculture intensification. She and the collectives she belongs to have credible stories of trying crop diversity and value chain development . Government of India launched a program to identify and honor women farmers for their innovations and entrepreneurship in agriculture challenging social and economic adversities. The national broadcaster Prasar Bharati serves as the nodal agency to identify, screen, shortlist and finalize such exemplary farmers from all over the country. The regional centers of Prashar Bharati identify such farmers and nominate them to the national competition. This year Jharna was identified by the Jalpaiguri center of Prashar Bharti who finally reached the national level competition. 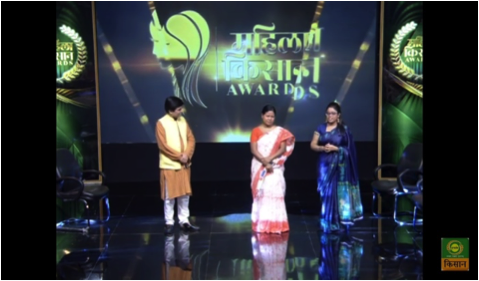 Two national level scientists, Dr. Malbika Dadani and Dr. Baldeo Singh, and a renowned and nationally celebrated folk singer, Ms. Malini Awasthi, were members of the jury. The final round had two contestants, Jharna from West Bengal and A .Koddma from Andhra Pradesh. Based on the questions and answers Jharna was awarded a score of 78 compared to Koddama’s 67. Based on the scores the two were acknowledged and felicitated by the Deputy Director General of the Prashar Bharti, Government of India. What does the story convey? Jharna continues to be a simple, well-grounded woman farmer. With her expsosure from the DSI4MTF project and other similar initiatives, Jharna has established herself as a farmer with credible credentials and is being approached by different `agencies for sharing her understanding and capabilities. Now she has agreed to a request from the local rural livelihoods program of the government to support their sensitivity and capacity building initaitives. This also demonstrates that DSI4MTF’s work is not just about spreading information, but also about passion and commitment . This is definitely a condition of scaling deep. You are currently browsing the DSI4MTF blog archives for March, 2019.